Efforts across the state to combat the morbidity and mortality associated with the addiction epidemic are ongoing. Thank you for your diligence in working to impact this challenging and complex issue. Last year, 2016, ended with a 38% increase in overdose deaths in Virginia and early 2017 shows no improvement in that trend. Our concerted efforts and collaboration across communities in an “all hands on deck” approach are the only ways to effectively address the problem. 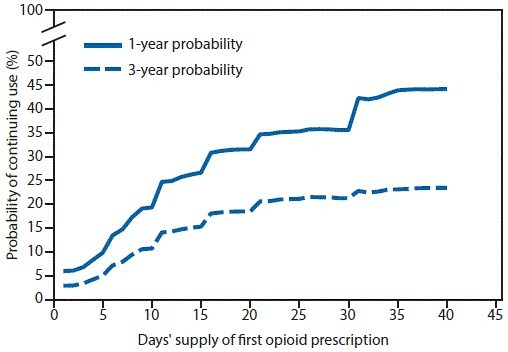 Risk of Addiction: A recent MMWR article demonstrates that the likelihood of chronic use of prescription opioids begins after only three days of acute use and increases with each additional day. See the Graph below or read the full article. Opioids should be prescribed when the benefits outweigh the risks. Some of your patients will continue to require long term treatment. Please note that the new Board of Medicine prescribing regulations support such treatment when done in line with best practice. Both the Virginia Board of Medicine and the Medical Society of Virginia have placed best practice guidelines on the treatment of chronic pain on their websites. Prescription Monitoring Program: The Board of Medicine Regulations on Opioid Prescribing took effect in March and initial PMP data indicates a decline in schedule II (opioid) prescriptions. You can view the regulations and an FAQ on the Board website or on VaAware. The regulations do not prevent the treatment of chronic pain. By following best practices in treatment, monitoring and documentation, physicians can prescribe to the patient what they believe is indicated without risk to their licensure. VaAware: www.VaAware.com continues to develop as the online, one-stop destination for consumers, health professionals and law enforcement with information related to Virginia’s Opioid Addiction Public Health Emergency and the state’s response. A collaborative effort of four state agencies (the Department of Health, Department of Behavioral Health and Developmental Services, Department of Criminal Justice Services and the Department of Health Professions), the website contains numerous resources such as data reports, practice guidelines, FAQs, fact sheets, links to options for treatment and recovery, CME resources and recommendations for safe storage and disposal of unwanted drugs. VaAware also includes a library of educational information for prescribers, law enforcement, EMS and the public. One of the website’s most frequently visited pages is the Virginia Opioid Addiction Indicators Dashboard, which summarizes health outcomes in the state related to opioid addiction and overdose. Users can track trends by location, age group and year. Addiction Disease Management: These sessions are offered across the state to train providers and clinic staff on outpatient addiction treatment and will wrap up with five Saturday sessions in the August timeframe. Contact Lisa.wooten@vdh.virginia.gov or go here for more information. Addiction Recovery Treatment Services: In efforts to address the opioid addiction crisis in Virginia, the Department of Medical Assistance Services (DMAS) implemented several initiatives this year. The most significant is the enhanced Medicaid substance use disorder treatment benefit – Addiction and Recovery Treatment Services (ARTS). Implemented April 1, 2017, ARTS expanded substance use treatment benefits to all 1.1 million members covered by Medicaid and FAMIS. ARTS has resulted in approximately 400% increase in addiction treatment providers participating in Medicaid, including residential, intensive outpatient and partial hospitalization and Medication Assisted Treatment. On July 1, 2017, DMAS implemented Peer Support Services, an evidence-based service providing peer to peer activities by certified professionally qualified and trained Peer Recovery Specialists (PRS). Other DMAS initiatives to reduce the misuse of opioids include a Patient Utilization and Monitoring Safety Program and the adoption of the Center for Disease Control and Prevention Guideline for Prescribing Opioids for Chronic Pain. 21st Century CURES Act: As a result of this legislation the Department of Behavioral Health and Developmental Services received $9.7 million. Of this amount, $5 million has been allocated to 18 community services boards to expand access to evidence-based medication assisted treatment and clinical support services for individuals who are addicted to opioids. Additional funds will be used to establish pilot projects that will include immediate support for individuals in local emergency departments who are rescued from opioid overdose as well as “warm lines” to provide support to these individuals. Prevention services in these CSBs as well as an additional 17 CSBs will be expanded to focus on the opioid epidemic. Funds will also be used to make naloxone available to local residents at no charge through local health departments and to provide technical support to prescribers who are qualified to prescribe buprenorphine to treat opioid addiction but who feel they need clinical consultation. Resource Catalogue: The health department is working with other organizations to develop a map-based resource catalogue. By clicking on a region of the state, you can see a list of treatment providers and sort them by type of treatment. Given its breadth, the catalogue is in continual evolution. Any input is welcomed! Comprehensive Harm Reduction with Syringe Services: As of July 1, 2017 per Section 32.1-45.4 of the Code of Virginia, the State Health Commissioner may establish and operate comprehensive harm reduction programs that include the provision of sterile hypodermic needles and syringes. Such programs shall be located in communities where data indicate an increased risk of the transmission of infectious diseases as a result of injection drug use. For more information, including the approved standards, protocols, and application materials, visit our Comprehensive Harm Reduction website. Given that the law just went into effect, no such programs are yet in operation. Later updates will identify any such programs that become operational. Naloxone Availability: The availability and use of naloxone is a major strategy to decrease the harm caused by the disease of addiction. Review of naloxone use over the last quarter shows an increase. A pilot project to dispense free naloxone to the uninsured was completed in three local health departments and is being expanded to include all health departments. In addition, health districts are partnering with local law enforcement and emergency medical service agencies to provide naloxone to their front-line personnel. Contact your local health director for more information. Thank you again for all your efforts to assure your patients receive the most appropriate care possible. Your work is a key part of the activities to combat the addiction epidemic. We will be dealing with this issue for quite some time, however we know that together we can work constructively to mitigate the threat and also prevent additional Virginians from becoming addicted to opioids. Virginia Department of Health David E. Brown, D.C.